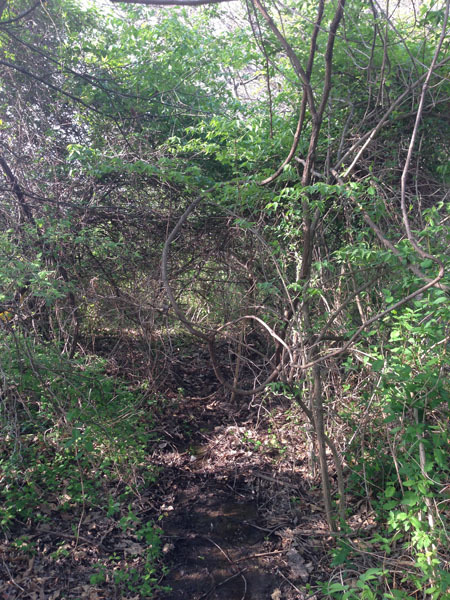 New in 2015, this trail runs the length of our property line in a woodland setting. As time and funds permit, we’ll be adding native and medicinal plants, creating a teaching trail for the community to enjoy and learn from. The purpose of this trail is to educate the community, enhance native and endangered plant species, create wild spaces for wildlife to habitat and to cultivate at risk and endangered medicinal herbs. 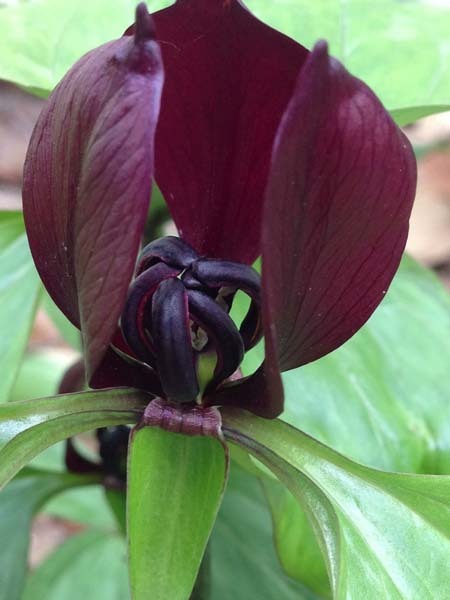 Trillium blooming in the woodland garden. 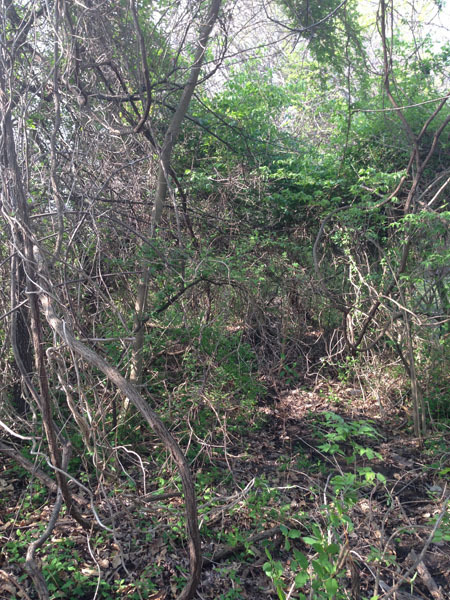 Clearing of invasives – We will be removing large amounts of bush and vining Honeysuckle from the area to make room for a multitude of wood land natives and medicinals. Much of the debris will go towards creating natural habitats for wild creatures to make their home such as birds, insects, rabbits and other small woodland animals. 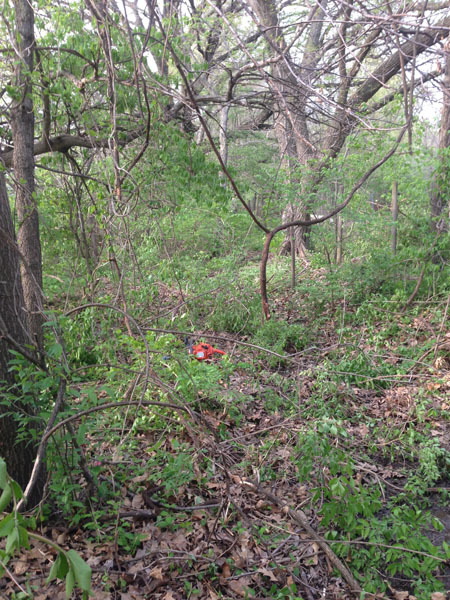 Clearing trash and debris – The previous tenants of our property viewed our land as a trash dump. There are lots of beer bottles and cans (they held wild parties that the town is still talking about 20 years later), old household goods and car parts as well as trash that has blown in from the subdivision. Planting of natives and medicinals – We have plants we will be transplanting from our gardens and friends’ gardens as well as many that we have on order to plant as time and funds permit. 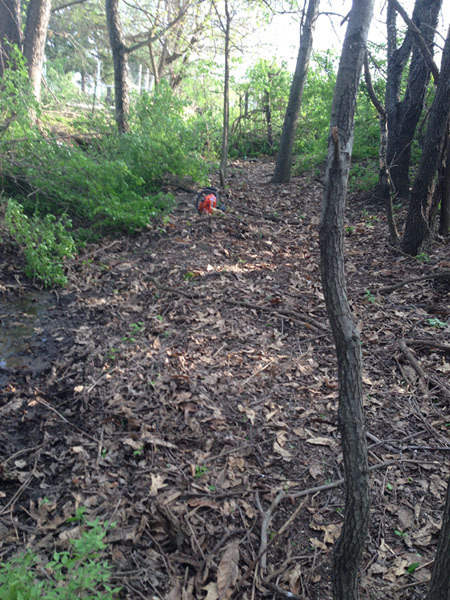 We hope to create a native oasis that will benefit the community and the local fauna. Turning around and looking the other way, you can see the wall of Honeysuckle we’ll be facing in the next day of hacking. 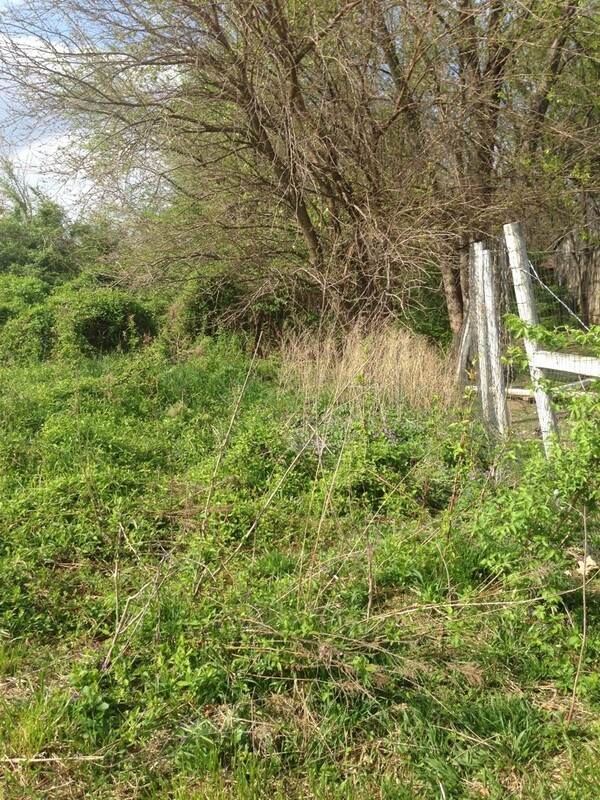 The greenery on the right is Honeysuckle that has been cut down and ready to be cleared out. We are mostly throwing it into the pasture at the moment for the goats and sheep to clean off then we’ll burn the stripped branches once they dry out. That white glob in the back is a pile of trash that I gathered to be picked up and thrown away. 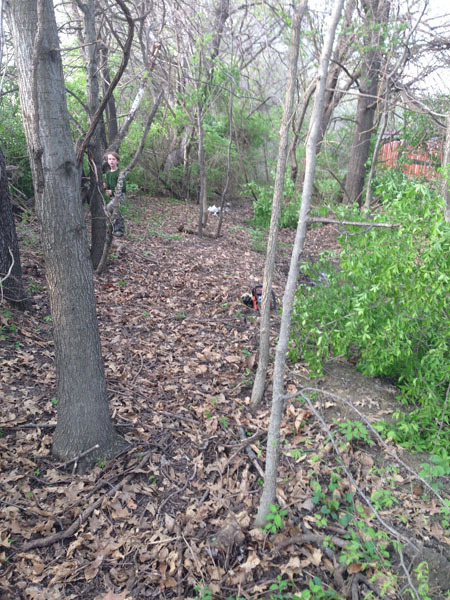 There is so much trash all along the trail, a lot of it blows in from the subdivision (on the left side of the entire length of our property). Sage was excited to start building himself a debris hut as we worked. Before shot of what we’re working with. Another before view. That’s the stream running through the center. Hey! 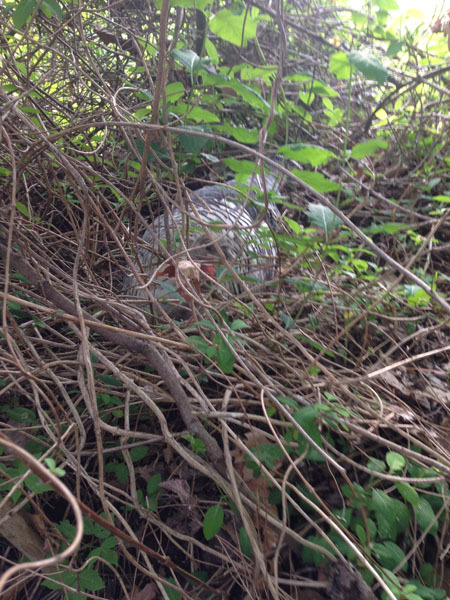 There’s one of our mama turkeys, setting on a clutch of eggs. 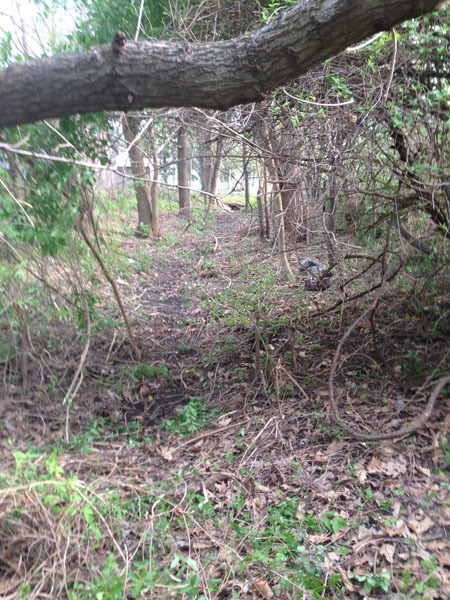 She wasn’t very happy to see us cutting down the brush around her, but we piled it back up to give her some privacy, she’s one of the first critters in our habitat hedge row! Labeling medicinal and native plants – Native and medicinal plants will receive a plaque that gives common and botanical names, historical and present uses and status if an endangered plant. The trail head will also have brochures with maps and points of interest/information about the medicinal and edible uses of many of the plants for self guided tours. Eventually I hope to also post signs explaining the natural habitats that we are creating for the fauna as well. Continue planting, including native trees and shrubs – We will continue to build up the natural flora each year, working to see which habitats within this location best suit the plants we are planting. Hosting plant walks for adults and kids – It is my ultimate goal to give guided tours to the adults in the community as well as the children of the community to teach them awareness about growing native species, not spraying their own lawns and how to create their own native gardens, incorporating native at risk plants into their landscapes to help preserve our native plants. Maintenance and continual planting – We’ll host work days for folks of the community to come out and assist with weeding out the invasives that are sure to return in the first few years of growing this garden and to help divide and spread the plants as they begin to grow.